Many have noted the re-emergence of the three-word slogan, as Malcolm Turnbull attempts to trigger a double dissolution that will rid him of these “damnable” cross benchers in the Senate. Copying his predecessor’s style, Turnbull repeated this slogan four times within two minutes in a recent interview with Leigh Sales. “Continuity with Change“! Turnbull stated that as he had been a part of the Abbott Government, he was maintaining policy continuity. Even Abbott confirmed this when he said from London “It’s very easy for me to campaign for the election of the Turnbull Government because the Turnbull Government is running on the Abbott Government’s record, and it’s a very strong record.”. Malcolm although, has claimed he’s made changes that were allegedly uniquely his. Could he have come up with a more meaningless slogan? Malcolm is desperately distancing himself from the slogan now, but is it meaningless for him or does it betray a strategy for “change” that is uniquely his? Aspects of Malcolm’s changes began to fit a familiar pattern which was expressed in his own words via last year’s science prize awards speech. Let’s examine the “changes” that Malcolm mentioned in the ABC as mentioned above interview, with a few he forgot, thrown in to illustrate the pattern. Clean energy innovation projects fund. I will deal with each only briefly. You can look up the links provided for more detailed analysis. Senate Voting reform was an initiative of the Greens (rather than Malcolm or the Liberals) that began a decade ago with Bob Brown in 2004 introducing legislation to reform Senate voting. Idealistically to limit party control over preferences between parties for “Above the Line” (ATL) voters, the new system still harvests preferences through the order in which candidates are listed. Ungrouped Candidates don’t get a look in at all with ATL voting. So independents will most certainly be disadvantaged. Yet it is the independents which have often held the major parties to account adequately for their policies to the people, rather than the normal a priori of factions, lobbyists and party ideology. People at the voting booth rarely have the time, inclination or education to understand all the issues. People’s political allegiances in most “democracies” are largely driven by irrational fears, family alliances, emotional opinions unrestrained by cognitive dissonance, and driven by self-interested media manipulation. When you consider that despite the protests about preferences, that each voter has complete control over them by simply voting “Below the Line” (BTL), and yet only 3% do, then what does that say about the average voter? Does not the problem with voting and preferences boil down to the propensity of Australians to be too lazy, too busy, too preoccupied, too disinterested, too ambivalent, too apathetic, too overwhelmed, too angry, too helpless, too pessimistic, too disempowered to make complex choices about voting. And that is what the Greens and the Liberal Government are counting on. Turnbull’s policies for mass transit/public transport in cities arrived with a new minister and new Cities and Built Environment portfolio. He gave this portfolio to the infamous Jamie Briggs, a junior minister without a significant expenditure capacity and without significant regulatory powers and under the “environmentally responsible” influence of Greg Hunt and the administrative support of the Department of Environment. This Underpowered portfolio has its origins in the Rudd Gillard government’s series of reports on City infrastructure issues as Alan Davis listed out in an earlier Crikey article. Perhaps that is from where Malcolm got his ideas? Malcolm Turnbull’s own words about Media ownership reform to Leigh Sales were that they were “…kicked into the long grass, never to be seen again, apparently; taken out. It is now the Government’s policy.“. Historically, not even the “captain’s calling” Abbott had tried to deregulate the media laws despite his efforts to reduce what he referred to as “Red Tape“. Instead the influences appear to originate from lobbyists from commercial media outlets that have worn bare, the red carpet trail to Canberra to argue their case. Does the public want a diminishment of media laws that results in fewer voices in rural media or local news and permit a concentration of media in singular hands (guess who’s) as mergers and acquisitions occur? Funding for domestic violence prevention from Turnbull represented a fraction of the money originally stolen by Abbott (1/3rd), which he then re-invested in an odd assortment of extras not highly sought after by any woman’s support groups. Websites, GPS bracelets, alternative legal aid, police counselling, locks, CCTV & 20,000 mobile phones benefit IT professionals, security companies, police, and communication providers more than it does abused women. What women’s groups asked for was Shelters but wherever Malcolm got his ideas from it wasn’t from the afflicted women. CSIRO was another example of only a portion of the $110M Abbott cut being reallocated with completely unasked for commercial provisions. As with Domestic Violence where many of the legal services and shelters were gone by the time Malcolm gave some money back, several CSIRO projects complete with the experts that researched them were also gone. 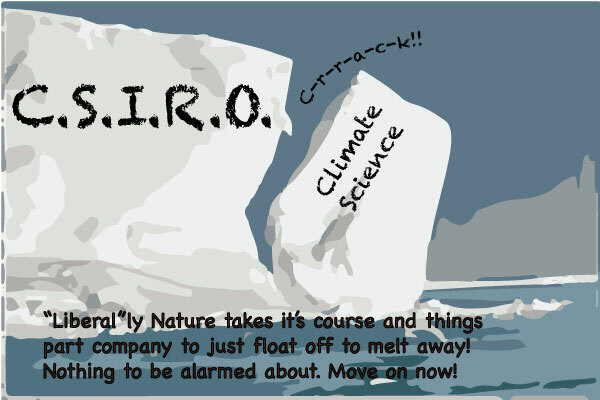 Abbott had installed a venture capitalist, Larry Marshall, as CSIRO chief executive who only a month ago astonished the scientific world by abandoning climate data gathering and modelling. Turnbull’s refunding itself was tied to increased commercialisation of research. Malcolm’s efforts for business continuity and changing corporate bankruptcy laws are based on the Productivity Commission’s report on insolvency law, where such things as “reducing personal bankruptcy to one year”, “introducing a safe harbour for directors during restructuring” and “nullifying ipso facto contract clauses” have captured Malcolm’s attention. Malcolm has cherry picked these from the Productivity report – which in other circumstances he appears not to have read (see point 8). The collective of Australia’s less reputable fraudsters in Business are positively ecstatic at these protections for consumers dissolving. The question has to be for whom does the benefit of such changes serve, Business corporates or consumers? Let the buyer/voter beware! Abbott’s aggressively ideological agenda to protect coal at the expense of the Clean Energy Finance Corporation (CEFC), by directing it to cease investment in wind farms and domestic-scale solar projects and the cutting of $435 million from the Australian Renewable Energy Agency’s budget (ARENA); has seen some change under Malcolm Turnbull. Originally Malcolm had refused to support the CEFC which had been turning a profit at 3 per cent over the bond rate. Then in a rapid change of mind, Malcolm announced a new “Clean Energy Innovation Fund” (CEIF) to be in a manner managed by both these organisations. The problems with the proposal are multiple. The term “fund” is a misnomer because what it is, is a loan. Requiring a return on investment will limit the scope of renewable innovation in Australia. Malcolm’s “change” to turn grants into loans, was to placate the conservatives in the coalition who preferred to be dismantling the agencies. The remit for the CEIF is oddly very similar to what ARENA was already doing in the area of renewable energy, so it seems apparent Malcolm is just repackaging an existing concept in a more conservatively climate-denying placation of his backbench. On ABC national Radio on the 22nd March, the morning show with Michael Brissenden, Malcolm spoke of the Heydon royal commission’s findings as “compelling” and “recommended” support for the ABCC. The Royal Commission’s 79 recommendations made no mention of the ABCC. In fact, upon reading the report, Hayden had recommended continuity of the pre existing regulator with beefing up investigatory and compulsory powers. Turnbull in his interview with Leigh Sales said “The Howard Government set up the Australian Building and Construction Commission to have a strong industry watchdog which reduced disputes. It improved productivity by 20 per cent. The Labor Party in government, Mr Shorten in fact as the minister, abolished the ABCC …” Leigh Sales replied , “… a report by the Productivity Commission in 2014 found that the introduction of the ABCC didn’t improve construction productivity overall and nor did the removal of it have a negative effect. Overall its impact was fairly marginal.” When Malcolm Turnbull disputed this she held up the report in her hand and said she had it with her. The claim of 20% improvement along with the suggestion it was bringing $6 Billion to the economy was based on a discredited report by Econtech which even the ABCC removed from their website. 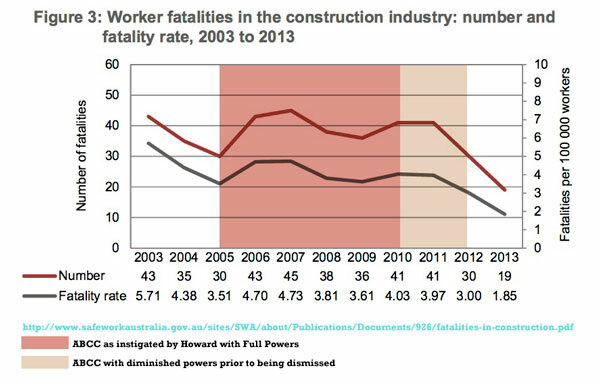 The bad safety record of the ABCC alone should be reason enough to be concerned it is an inappropriate solution. So why resurrect a commission that in truth had such a minimal impact on productivity and a downfall on safety? Malcolm had certainly read the Productivity Commission’s report to have implement it’s recommendations on insolvency law (as mentioned earlier) but apparently only cherry picked from it? Econtech was discredited a long time ago, so why try to sell it as something is wasn’t? As Michael Brissenden pointed out to Malcolm, “ABS figures from December last year show overall industrial disputes diminishing and days lost due to industrial disputes down considerably from 2012”? Instead of supplying evidence against either ABS or the Productivity report Malcolm resorted to anecdotal opinions based loosely on the maligned Royal Commission saying it found there was a “culture of lawlessness in the construction sector”. Despite the Commission’s Aug 2015 findings that referred 30 people for various charges, already 5 of these have had their charges dismissed. Let’s face it if Malcolm were honestly concerned about corruption, then why resist the numerous calls to have a federal ICAC instigated in the face of the NSW illegal donations discoveries? Is the pot calling the kettle, “black”? So why try to resurrect a Howard initiative for a lack lustre body like the ABCC with a dubious success record, for a single industry, that already has regulators in place and have that as a trigger for a Double Dissolution? This in more of a late mention or side note as this change isn’t in yet, but after Abbott made $57 billion in health cuts, apparently Mr Turnbull wants to return $5 billion and thinks that is a solution of merit to take to the next budget. Anyone yet figured out one of the patterns in his approach? In his own words, this soft “plagiarism“, dominates the changes he has wrought. There is a typical pattern of evidence of previous governments, reports and communities that have held pre-existing ideas which appear to have been mostly regurgitated, modified, re-costed with cheaper alternatives, to be released as his re-badged “changed from continuity” policy. 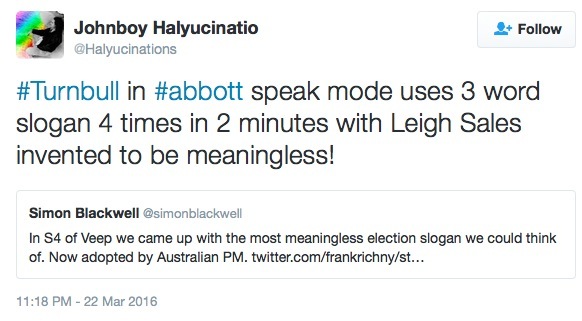 Not withstanding the couple of additions I’ve included, Malcolm was happy to call them his changes to Leigh Sales. Despite his penchant for spending millions promoting his innovative “ideas boom” ($28 million to date) there is nothing revolutionary, innovative or creative being generated in these “changed” policies. Now to be honest, is there anything that says a policy has to be innovative? No! It is also fair to say that many of these are at least a partial recovery from the ideological destructiveness of the Abbott Government (ABCC not included). It is also fair to say that none of these organizations or causes have a hope of recovering to the point they had progressed to, before the Abbott Government under any of these “changes to continuity”. Most of them will, in fact, be easy targets for abuse and/or mismanagement. For Malcolm, these are low-risk manoeuvres that fly under the radar of his neo-conservative right-wing backbench, that – where they will fail – he can pass them back to the originator of their idea, but where they succeed (if any of these possibilities can) for which he can claim credit. Win-Win for him, perhaps not for us. So as many, including Tony Abbott, are saying the Coalition’s policies represent a continuation of the Abbott government, Malcolm was pitching for “Continuity with changes”! Re-branded, reworked, low cost, low impact, policy changes that represent the re-branded concepts of other people, introduced in a manner that has largely dismantled their previous record of success and for which future successful outcomes are in considerable doubt. Simon Blackwell in an interview with the Guardian described the slogan as “hollow and oxymoronic”, but perhaps that is the way we ought to explain the changes from the Abbott continuity implemented by this, new leadership.